Report stolen or lost cards to the Campus Card Office or after hours to WSU Security - Sheehan Hall. Lock your card at either of the locations above or using your Manage My ID account. Notify the Library — students may be liable for books checked out under their card. Note: Students who lock their cards will not have access to their meal plans. Contact Bruce Bechtle, Director of Dining Services (phone: 507.457.5505) to request a temporary eating pass. If you don’t find your card, you will need to visit the Campus Card Office in Maxwell 227 to request a replacement ID immediately. The cost of a replacement ID is $20. When a student loses their card, they can lock their own card using their Manage My ID account by simply clicking on “Report a Lost Card” and then clicking “Submit.” This will prevent the card from being used. 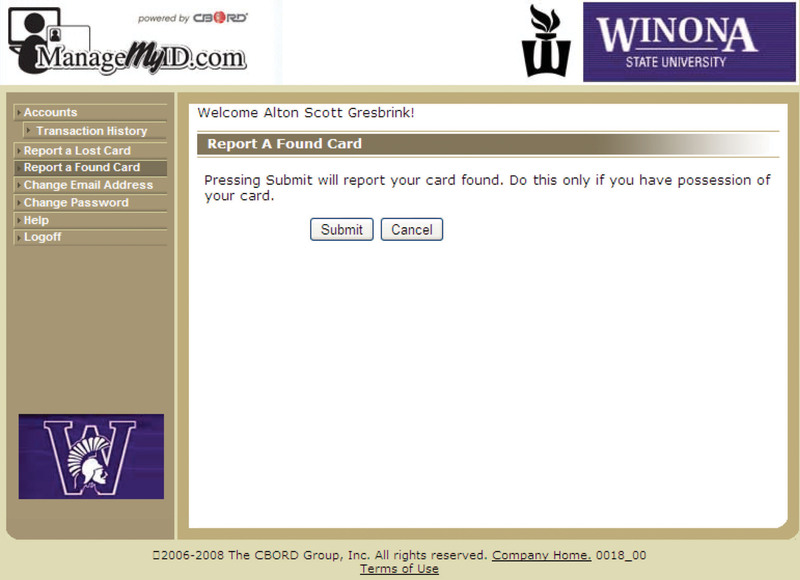 If the student finds their card, they can click on “Report a Found Card” and then click “Submit.” This enters their card back in an Active Status for use.